Now in its 13th year, Bonnaroo kicked off in Manchester, TN on Thursday with a blazing southern sun (and repeated crowd chants of "U.S.A.! U.S.A.!"). Tim Baker and Adam Hogan of Hey Rosetta! played the tiny Sonic Stage, but were met with an enthusiastic audience (some of whom had the forethought to bring along a Newfoundland flag to wave). Aside from old favourites like "Welcome" and "Bandages," the two ran through a handful of new songs, including "Alcatraz," "Cathedral Bells" and "Promise," and announced the completion of the band's full-length follow-up to Seeds. The stripped-down band line-up made for a mellow piano- and strings-free performance, but one that worked as a charming afternoon set. 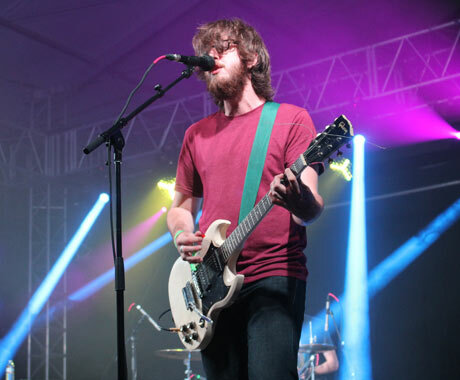 With main stages not open yet, tent shows drew enormous crowds in the evening. The jangle of Real Estate filled the festival grounds from That Tent, as the band delivered cuts from the recent Atlas. Bathed in purple and aqua lights, the New Jersey band had the crowd moving and singing along, especially during set highlight "It's Real." Cloud Nothings walked nonchalantly onto the stage at This Tent, then exploded into a set that drew from Attack on Memory and Here and Nowhere Else, including an extended jam-heavy version of "Wasted Days." Remaining practically silent throughout the set, frontman Dylan Baldi proved that he wasn't there to make conversation, he was there to make noise — and considering that there were only three guys on the stage, they made a lot of it. "Stay Useless" proved rambunctious, igniting one of the first mosh pits of the weekend, which continued to grow throughout the set. The highest energy of the night though, radiated from the Other Tent, where Pusha T took the stage to a riled-up crowd that only got wilder throughout the set. Firing off the best of last year's My Name is My Name, Pusha also made sure to give multiple shout outs to his home at G.O.O.D. Music and spit a mini best-of set of his work with festival headliner Kanye West (including "So Appalled," "Runaway," "Mercy" and "I Don't Like"). As for his solo stuff, "Numbers On the Boards" and "40 Acres" were particularly impressive. Constantly assuring the crowd between the songs that "We're not done" and thanking fans for supporting his record, Terrence Thornton had the crowd in hysterics when he teased Clipse's "Grindin'" a couple of times. Finally closing out his set with it for real, Pusha T received the loudest response of the evening, serving as a de facto headliner for the festival's first night. As part of the evening's biggest scheduling conflict, Ty Segall played parallel to Pusha T, casting a massive net of fuzz over the crowd at This Tent as his screeching vocals and wailing guitars made sure no one was falling asleep, despite the 1 a.m. timeslot. It was a fine start to a weekend that promises to only get better with Vampire Weekend, Neutral Milk Hotel and Kanye West on the bill for Friday.